What is the IELTS like? How is the IELTS scored? You will find that it is not misplaced and that the fee you will pay us to get your Eligibility Assessment Report is a sound investment. Rest assured that our Report and your payment do not bind you in any way to engage our services lateron. 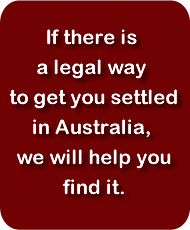 If our report confirms that your are indeed eligible to emigrate to Australia, you can still decide to manage the application process yourself or to engage the services of another migration agent. However, should you appoint AMES as your Migration Agent, the fee you have paid us (AUD220) will be credited against our future service charges. The Eligibility Assessment Report we will send you is prepared by a Registered Migration Agent who will be your own personal consultant. It is NOT generated by a computer. You will receive a comprehensive and detailed report containing our conclusion regarding the viability of your migration application, together with the reasons for it and our recommendations. Before you go ahead and take the next step, we invite you to view a sample Eligibility Assessment Report prepared by us and compare it with eligibility assessments you may have seen elsewhere: you will see that we really do give value for money! But the benefits don't stop there! access to our On-line English Test (if you don't have a recent IELTS score), together with a report on the results and our estimate of the number of weeks you may need to study English to reach the level of English required for the visa application we recommend.